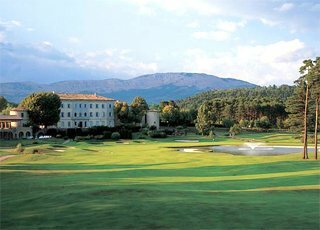 Situated at Le Logis du Pin, an hour's drive from Cannes along the Route Napoléon, the 18th century castle has been transformed into a 4-star hotel that nestles in a woodland setting. Everything, including the main building suurounded by four pigeon lofts, the manor and little Chapel forming a small Provencal hamlet of unbelievable charm, has been restored with the ulmost care to preserve the authenticity of the site. Old stones, terra-cotta tiling, roofs of Romanesque tiles, old-fashioned faucets. Souleiado fabrics for the drapes and bedcovers : the beauty of the past and modern comfort are here united in perfect harmony. Utter silence and nothing but nature in all its authenticity for observant eyes.